There are a number reasons why your employee advocacy program may not reach the giddy heights you were expecting when you initially launched it, but the most common reason of all is content. Content is the beating heart of your employee advocacy program - not the tool. Get it wrong. Employees simply won’t share. Worst case, they won’t bother logging in again. A few weeks ago, I ran an exercise with a team of marketing directors. I asked them first to list all the content they felt should be part of an employee advocacy program – by topic and by type. Easy. I then asked the same group to put a star next to the pieces of content they, as individuals, would be willing to share on their own professional social networks. Different story. Before you launch your advocacy program, take the time up front to really understand who your audiences are and the content they might want to consume. Be careful not to put people in boxes based on their function. Instead, consider their motivation. Who wants to be a thought leader vs who wants to sell something. Then set up the categories based not just on what the brand wants to amplify but what will also engage your employees! It's worth remembering that Employee advocacy isn’t about building a channel to push content through (although that is a positive by-product). Employee Advocacy about giving your employees a safe environment to build their authentic voice on social media through content sharing. Some employee advocacy tools allow your employees to import their own content feeds into the tool. Encourage this and support your employees to create their own unique voice on social. I believe a collective set of unique voices is better than an orchestrated chorus of parrots. Here are 10 content categories you may want to consider. Curate third party content from leading publications that your target customer may read. This kind of content really supports your Social Selling program. It keeps Sales relevant, timely and supports their ambition to be front-of-mind with their networks. Professional social sellers need content. Make this the destination they can find it. Good news stories are great for engagement – especially on Instagram as this TrackMaven report shows. People love to high-five a new customer, office building or job promotion. Share these good news stories with your employees. Small signals of success are a great affirmation to recently engaged customers. Superb support material for your Social Selling program. At the end of the day, business is about the exchange of money for goods and services. Informing customers of latest innovations and updates is an essential part of maintaining a relationship. Your sales, customer support and product development teams will most likely subscribe to these categories. If you’re going for a company wide employee advocacy deployment then consider this option. An internal category (e.g. no sharing enabled) for sharing leadership driven communications. Short videos from company leaders or internal polls. Communicate internally via engaging and interactive content. Give them a reason to keep coming back into the platform. Most organisations have a blog. Some are carefully managed. Others openly encourage their community to contribute. Either way, this feed should come into your employee advocacy tool. It shows thought leadership, expertise and (if done correctly) showcases authentic voices from behind your logo. Share the human side of your business and show what it’s like to work there. Perhaps you took a day out to help in the community or hosted a charity coffee morning. Bring out the personality behind the logo. Support the employer brand and show off the culture to potential employees. Employees don’t want to just inform their networks. They want to inspire them. According to LinkedIn, 62% of users engage with content that is informative and inspiring. Provide content that helps your employees to learn, open their mind and support their career. Content they can share and inspire their network with too. Sites such as Harvard Business Review, Forbes and Inc create superb skills related content around productivity and career management. Don’t make it all about work. 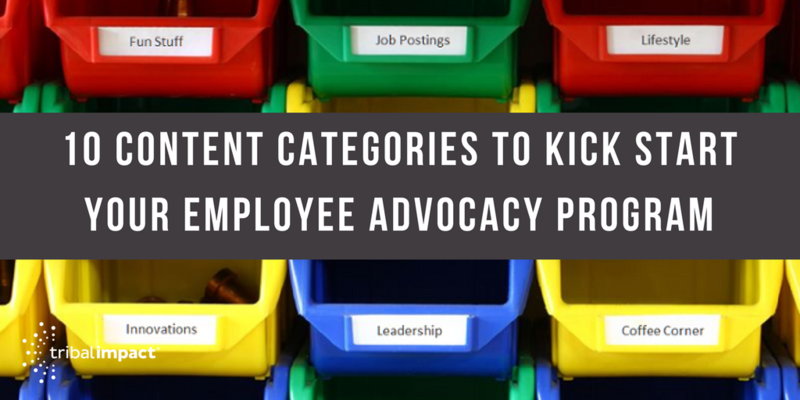 Most employee advocacy tools will allow you to share internal content so why not open a category for employees to share fun content with each other – the office party, behind the scenes at an event, the new coffee machine! Encourage a culture of content. Make it easy for your employees to step into creating their own content. How about your partner eco-system. Social advocacy isn't just about employees. Seek out content that is being created by your partners and build that into your advocacy platform. Strengthen partner relationships by showcasing their experts and content. You're extending your tribal impact to include your entire community. Consider pulling in content from your customers too! Any others to add? If you already lead an employee advocacy program, what are the most popular types of content your employees share? What do most subscribe to?